"Portobello mushrooms are stuffed with refried beans and topped with Cheddar cheese and homemade corn salsa in these fun fiesta cups. This recipe was made in a Panasonic CIO and appears on an episode of the Dinner Spinner TV Show on The CW!" Mix corn, cilantro, lime juice, jalapeno, 2 tablespoons cumin, 1 tablespoon onion powder, 1 tablespoon oregano, chopped garlic, and 1/2 teaspoon Himalayan salt together in a bowl until salsa is well mixed. Place grill pan in the oven and heat oven to 445 degrees F (230 degrees C). (Or turn on a countertop induction oven to Combo 1.) Cook in the oven until tender, 9 to 10 minutes. Mix refried beans, 1 tablespoon cumin, 1 tablespoon oregano, 1 tablespoon garlic powder, 1 tablespoon onion powder, 1 teaspoon black pepper, and 1/2 teaspoon salt together in a saucepan over medium heat; cook and stir until heated through, about 5 minutes. Remove grill pan from oven and spoon bean mixture into mushrooms; top with Cheddar cheese. Return grill pan with mushrooms to oven. Set oven to broil and cook mushrooms until cheese is melted, 30 seconds to 1 minute. 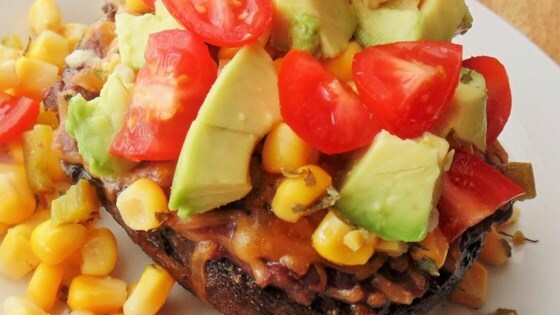 Spoon salsa over mushrooms and top with avocado and tomatoes. I am going to try this, it looks amazing! Lots of ingredients going on here but they worked well together. Only omission was the onion powder. Will make again! The refried beans were my favorite part of this recipe...so flavorful. I wouldn't have thought to season them, but it really made a difference. And the homemade salsa really topped it all off!